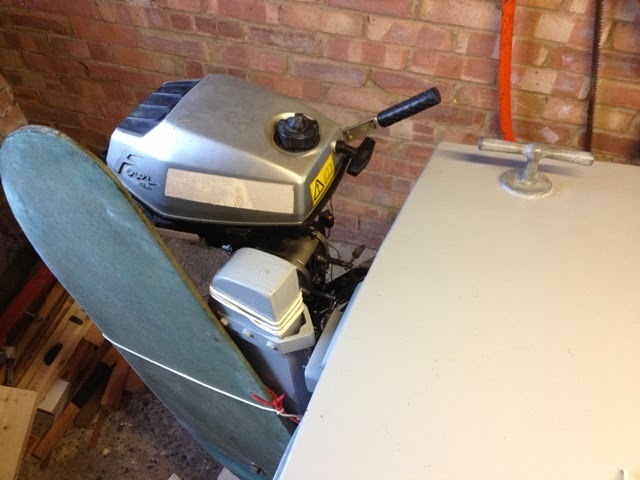 When Derek built ‘Minnow’ (Enuf) he placed the outboard bracket to suit his Honda 2.3. I was able to fix my bracket in exactly the same position with the same holes through the transom. 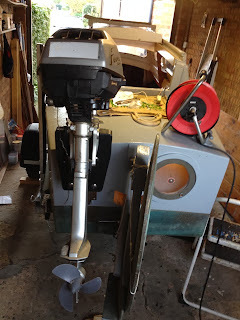 I have an old Honda 2 HP outboard which has similar dimensions and weight to those of Derek’s more modern engine. I’m happy about installing the outboard, because I know it will be very useful for moving the boat in confined spaces such as in a marina or among closely moored boats. Tides on the East Coast where I do much of my sailing can be strong, particularly on springs, and if I find myself in a situation where it is imperative to make way against the current, I can resort to the engine. I have found that when it is calm and the sea is smooth, a Honda 2.3 HP outboard can propel a Paradox at 3 plus knots with the throttle set at less than a third of full power. If the wind is on the nose and headway is not great, I shall be able to motor-sail for making better progress. Points in favour of having an engine outweigh those for not having one. The biggest ‘snag’ of having one is ‘snagging’ of the sheet on the engine, and if the sheet happens to become tangled in the propeller, getting it free can be a problem. I’ve done it, but leaning over the stern and reaching out to the prop is not for the fainthearted! You definitely do not want to be doing this in a seaway. I am trying to work out how best to avoid this situation. 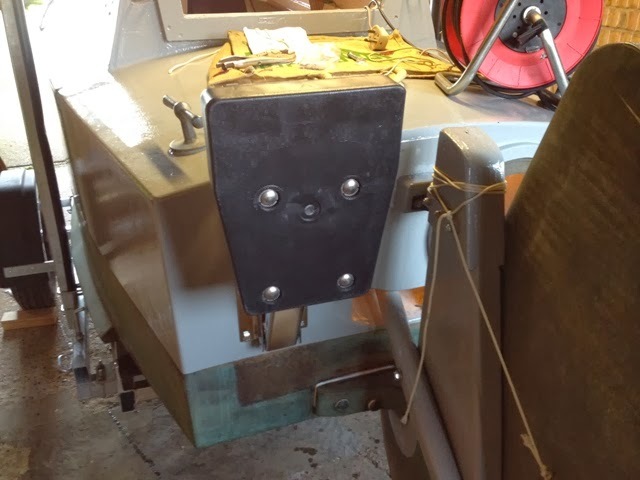 Pete who owns ‘Johanna’ has made a kind of cage attached to his outboard to minimize snagging, but as far as I can tell, it does not prevent the sheet from becoming tangled in the prop. I note that he has changed the sheet leads to come from the aft deck, instead of from the transom, and that may solve the problem. If anyone can make suggestions for keeping the sheet clear of the engine, I’ll certainly take note of them. Bill - possible to move your mainsheet attachment to mid boom?? There is a 'U'-shaped gadget with rollers that hook onto a boom in such a way as to allow the sail to be rolled around the boom. 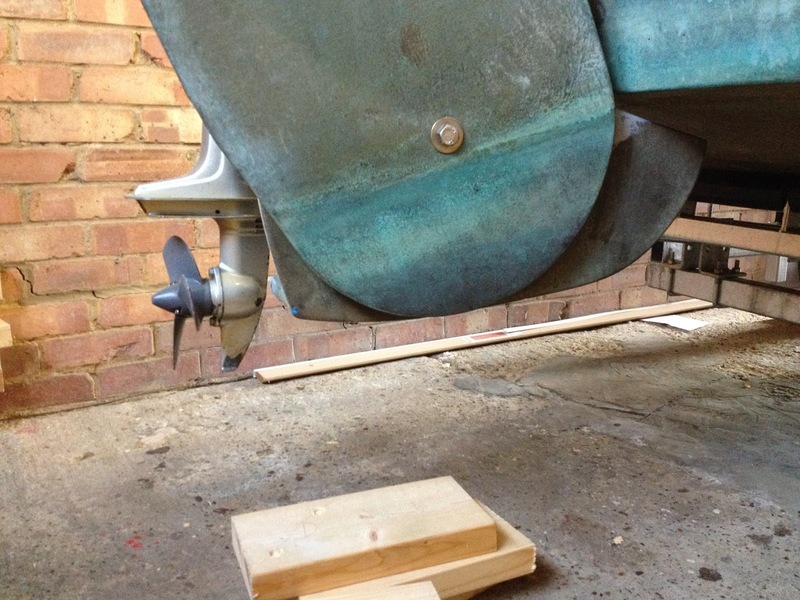 It is kept in place between the tack and clew by a metal rod attached to the fixed part of a gooseneck roller. It may be possible to devise a similar arrangement for Paradox, because the rod could be fixed to the gooseneck. I'll look into the possibility. Ah yes, boom claw roller reefing.. I have the same arrangement on my Hurley 20.... the claw is kept in place by a line to the end of the boom, and a separate line to the bottom of the mast that acts as kicker.. Thanks for that. Two lines simplifyy the matter. I'll have to think the procedure through to see if there are any reasons it can't be done on Paradox. The design of the Paradox makes it difficult to adopt a Gaff or [dare I say it ] fully battened main with slab reefing, mid boom sheeting and kicker. But have you considered a sheet from the boom end to a horse attached to the stern deck just aft of the cabin or to a central point on the aft of the cabin? The sheet angles close hauled aren't so good, but it looks workable..
Or converting the roller to slab reef ? This could give a vertical sheeting angle from the aft of the cabin to about 2/3 or 3/4 boom? I am considering a horse. The great advantage of the roller lugsail designed by Matt Layden is the ease with which it can be reefed, and this can be done from the comfort of the cabin when the going gets tough.